The Firefox rapid release cycle is up and in full swing. The very nature of it resulted in two Firefox versions with barely any new and exciting features. Both Firefox 5 and Firefox 6, which has been released recently, suffered from lack of time to implement features in the browser. This is now going to change with the upcoming release of the Firefox 7 web browser. One of the new features that is likely to ship with the browser is the new graphics component Azure. Likely means that the developers may still block the component from being included in the next iteration of the web browser if critical bugs are discovered during the beta testing phase. 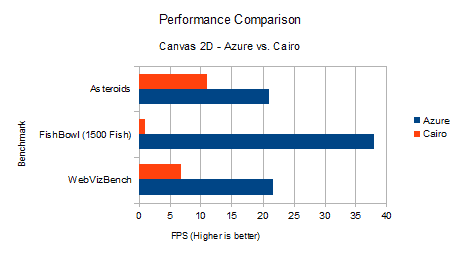 Azure promises better graphics performance than the current graphics component. The component is currently optimized for Canvas operations, where it can improve the performance significantly. The canvas element is part of HTML 5 which will become more important in coming years. In addition to these tests there were some tests which weren't easy to include in the chart since they didn't report frames per second. Two notable ones are the IE Testdrive 'Speed Reading' test, which ran in 6 seconds both with Azure and Cairo, however reported an average drawing time of 5 ms for Azure, and 8 ms for Cairo. Possibly the total time ended up still being the same due to the nature of timeouts in Firefox. A more outspoken difference was the IE TestDrive Paintball demo, which ran in 10.91 seconds on Azure versus almost 30 seconds on Cairo! Bas Schouten, one of the Mozilla engineers behind the Azure project, has posted information about the upcoming Azure release. He notes in a blog post that "that there's a very good chance that Azure will be shipping with Firefox 7". Some issues still need to be sorted out. Bart especially mentions that Azure may perform worse in some cases, especially when shadows are part of the canvas). Chances are good that Firefox 7 users will see Azure included in the web browser. While it is unlikely that the majority of users will benefit from those performance improvements right away (considering that HTML5 canvas is not widely used yet), it is a solid foundation that the developers can build upon. Another area where Firefox 7 will show significant improvements is memory utilization. Thanks for posting, first version that introduces significant changes.